There’s a trend in fashion that combines traditional elements with modern designs, sometimes reinterpreted to give a new meaning and a new life to old stories, legends, traditions, etc. This is not a new trend, and here in Romania we can find it in many areas, from clothes, shoes, bags and other accessories, to furniture and home decor. It’s true we cherish our traditions and our designers keep finding new ways to interpret them. Maybe one of the best use of elements that define Romania and Romanian life can be found in Lana’s creations. If this is the first time you’ve read about Lana…. “You can consider Lana an artist manifesting her beliefs through fashion as you would find Lana’s clothing in an art gallery or in a museum, rather than in a shop. 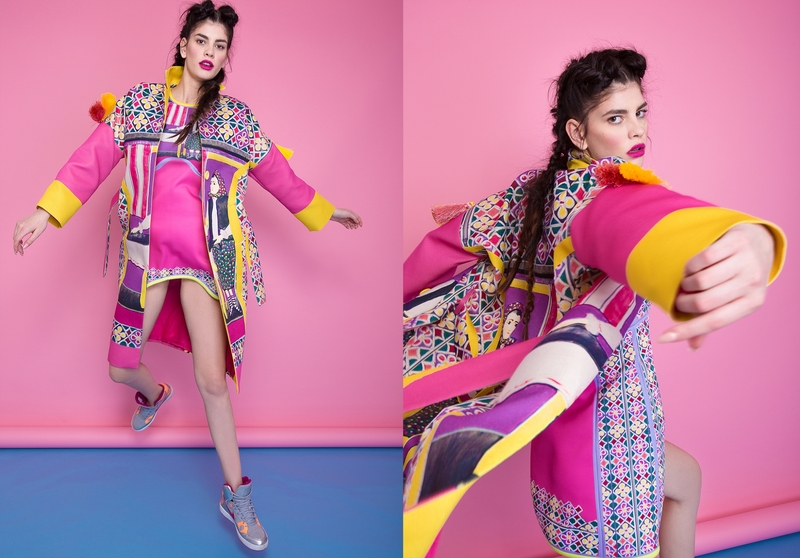 Her original style comes from the fact that she designs all her visuals and patterns, transforming pure white fabrics into strong unique conceptual pieces through the means of digital printing. Lana is now a brand that you’ll want to remember since even though she’s young, she is now one of the best known Romanian designers worldwide. These are some of Lana’s best projects, from my point of view. With 2 former collections inspired by the Merry Cemetery in Sapanta that were so very well received by customers worldwide, it seems like Lana has a real passion for this place, since she just launched the 3rd collection, named Sporty Sapanta. This new collection by Lana for MOJA, proposes new items and a streetwear approach of the Maramures inspiration, adapted for very active women. The sport couture collection includes shorts, dresses, long jackets and backpacks, all in various new prints, with distinctive elements such as colored elastic bands, a style specific to the sports equipment wore in the 90s. The whole collection can be found at MOJA, a multiband online store with a large selection of designers in different areas.